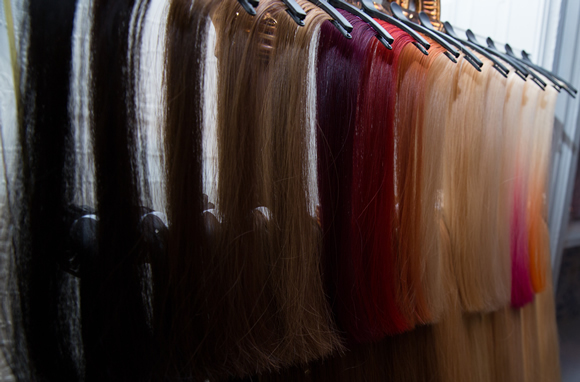 Quality is paramount throughout the processing of the hair extensions. The hair is cleaned before starting a gentle processing to remove the natural colour pigments in the hair, before being able to replace them to create the ultimate base shades. This osmosis treatment, pioneered for the cashmere industry, is so gentle as not to effect the structure of the hair & create reliably colour-fast extensions. Such care is taken that some colours may take up to 6 weeks to process. Hair is secured to guarantee the strands remain remi until it is hand colour blended by skilled artisans to create the full colour range we have available. The finals stage is for the hairs to be either tipped for pre-bonded extensions or made up into the clip in range.